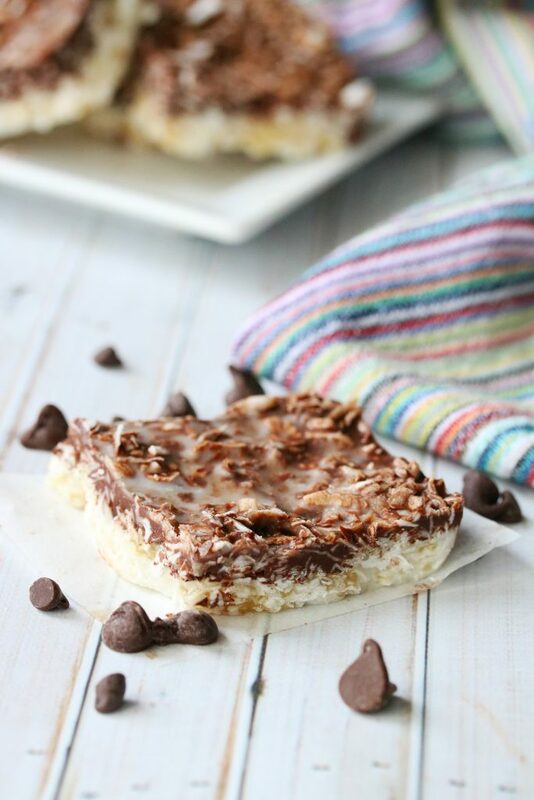 These No-Bake Chocolate Coconut Squares are the perfect snack to reach for! I love snacking and I try to have healthy options in the house so I make better choices. Doritos apparently are not a breakfast food, who knew? Bella also loves to snack and I’ve done a great job teaching her to pick healthy choices for her snacks. Thankfully she is not too picky, she loves almost every fruit and would pick yogurt and cheese over chips. Even though I work from home, I am extremely busy most days. I need to make snacks that are easy, quick and if they are no-cook it is a huge bonus! Whip up a quick, healthier snack for you and your kids today. 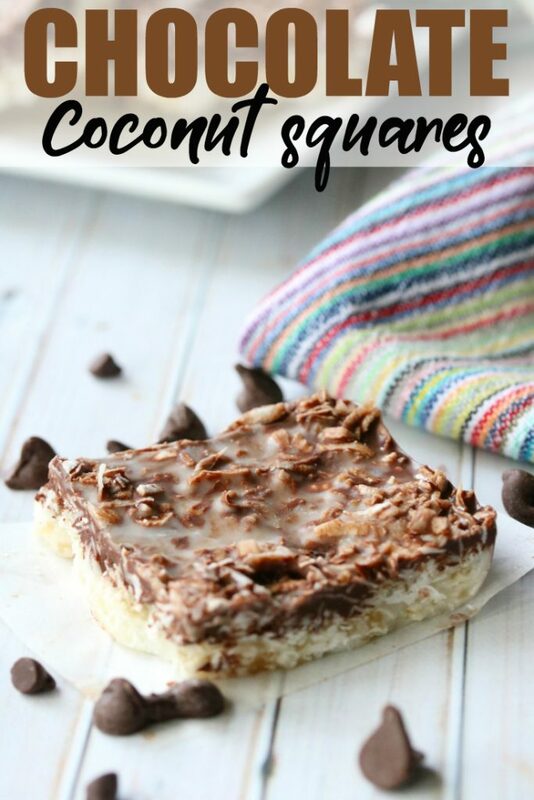 These chocolate coconut squares are the perfect after-school or on-the-go snack. 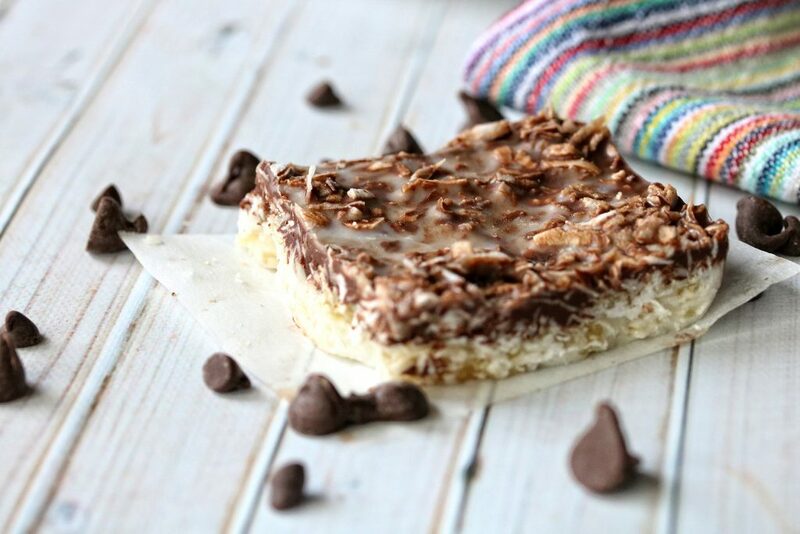 Not only is it super easy to make, it only has 6 ingredients and it is no-bake! Follow along with the step-by-step process images and find the printable recipe below! 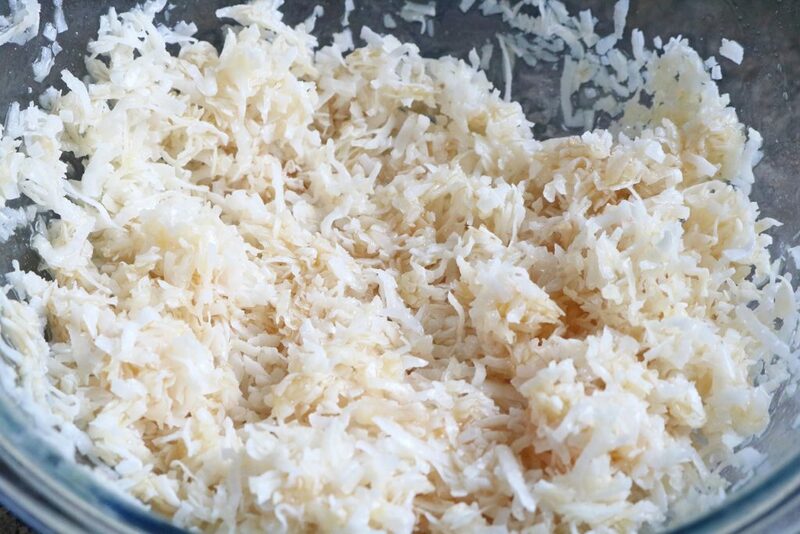 Place your shredded coconut in a medium-sized bowl and set aside. In a medium-sized microwave-safe bowl melt the coconut oil in your microwave in 15-second intervals until melted. 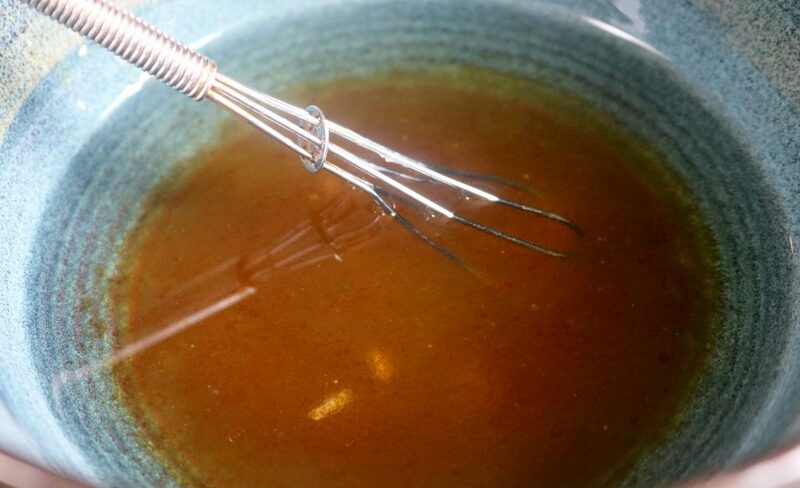 Once melted add in the honey and vanilla to your melted coconut oil and mix until combined. Next, pour your mixture into your shredded coconut. Mix well until all the coconut is covered and is sticky. Line an 8×4 pan with parchment paper and using a spatula, press the coconut mixture firmly into the pan. The more you press the better the bars will hold together. Place in the freezer to set for 20-30 minutes. Just before the bars are finished setting make the chocolate topping. 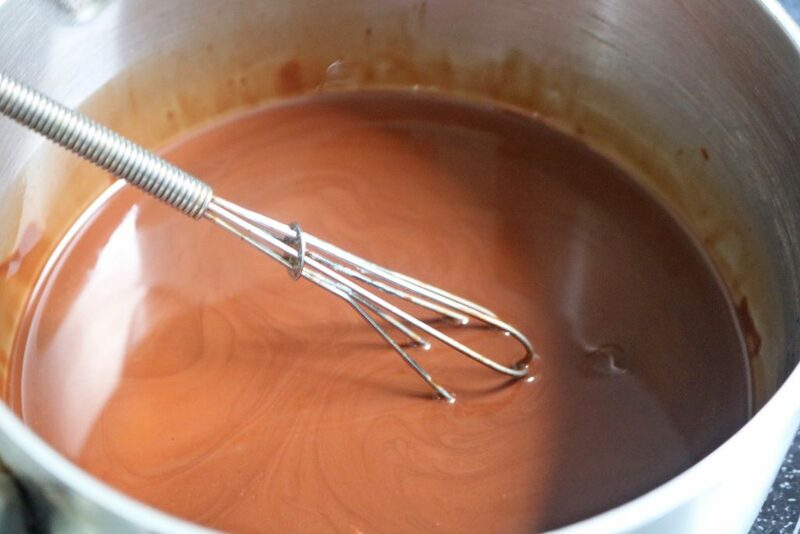 Place your chocolate and remaining coconut oil in a small pot on the stove over low heat. Stir constantly until fully melted. 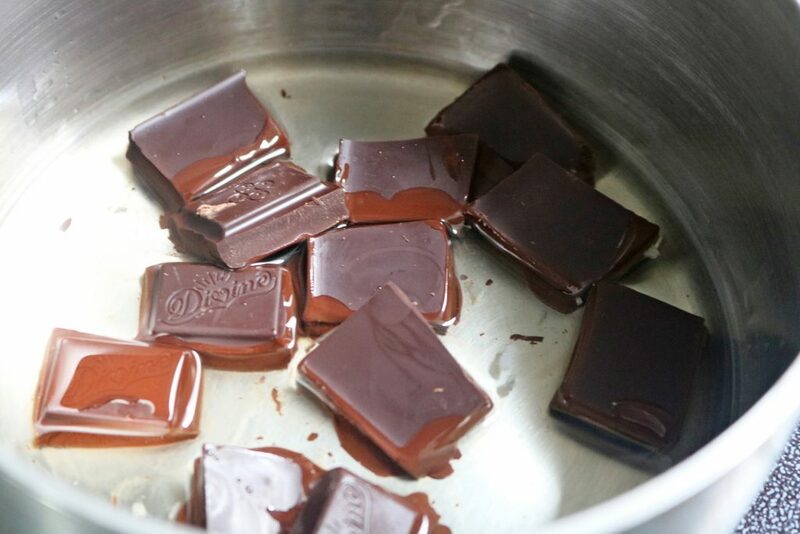 Alternatively, in a small microwave-safe dish melt the remaining coconut oil and chocolate bar in 15-second intervals mixing each time until melted and smooth. Once your chocolate is melted, pour it over the coconut mixture making sure the chocolate is evenly distributed. Return to the freezer for 30 more minutes until chocolate is hard. Remove from freezer and cut into bars. Let sit for 5-10 minutes before serving. You can keep these in the freezer for up to a month. Just wrap and place in a freezer safe container or bag. Whip up a quick, healthier snack today the whole family will love. 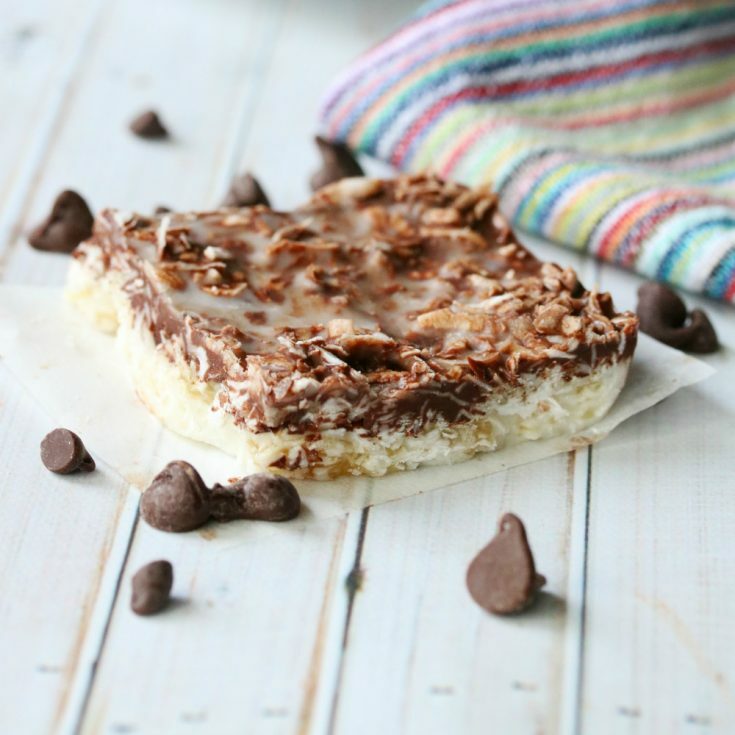 These chocolate coconut squares are the perfect treat for after school and on the go! In a medium-sized microwave-safe bowl melt the coconut oil. 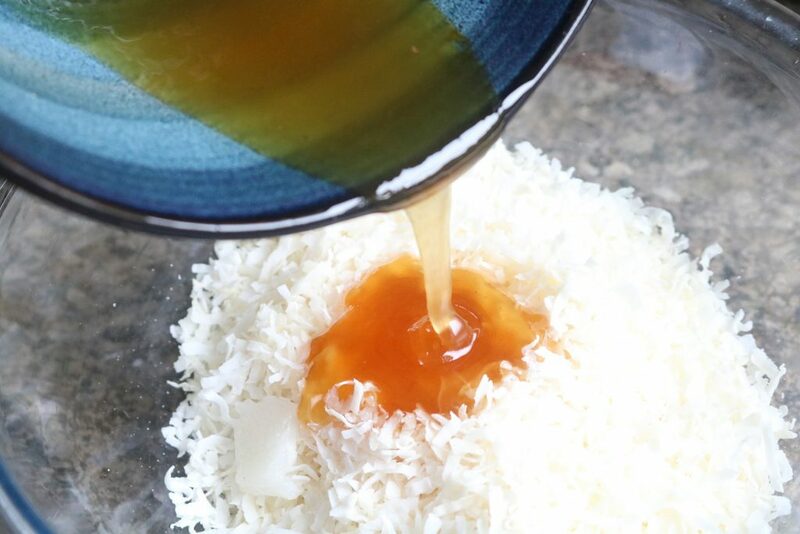 Once melted add in the honey and vanilla to your melted coconut oil. 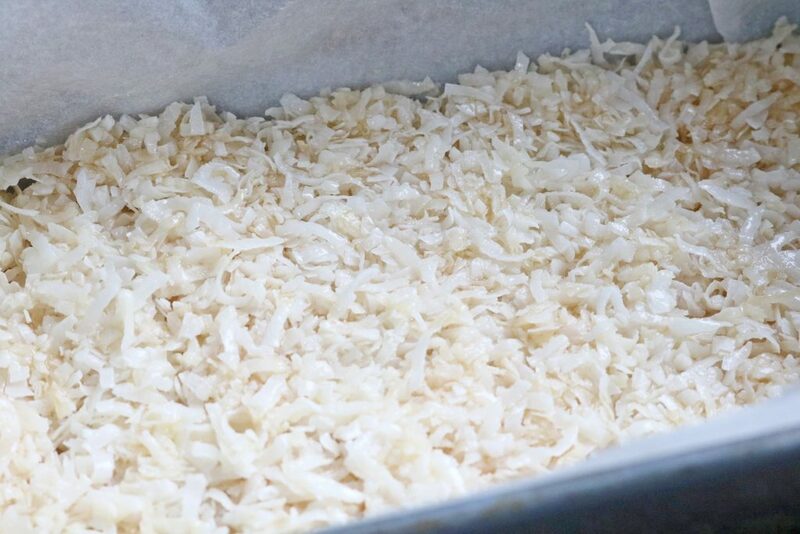 Next, pour your mixture into your shredded coconut and mix well until all the coconut is covered and is sticky. Line an 8x4 pan with parchment paper and using a spatula, press the coconut mixture firmly into the pan. The more you press the better the bars will hold together. Pour the chocolate over the coconut mixture making sure the chocolate is evenly distributed. Check out my recipe section for some more tasty treats! Those look delicious! Yum! I wish I had one right now. 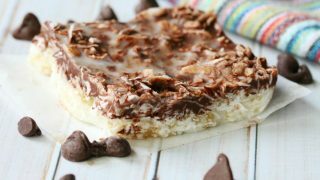 Love that they are no bake = perfect for hot summer days when you want dessert but don’t want to turn on the oven. I love coconut and chocolate and this recipe has a lot of both which guarantees I’ll love it. Plus it’s fairly easy to make ! I love anything with coconut, yum. These sound easy to make and delicious.